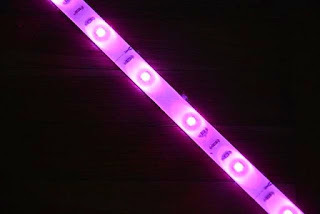 LED strip lights became one of the most versatile LED kitchen lighting option; they can provide the lowest profile solution; they are flexible, thin and can produce high brightness. LED strip lights under cabinet present a durable, energy efficient, long lasting light source, all that makes them a perfect for kitchen lighting, especially for under cabinet lighting. LED Strip lights is available in single color and multicolor options, they also available with many color temperatures that give you the flexibility to choose what fits your needs and make LED strip lights an ideal solution to decorate or highlight your kitchen objects. LED strip lights are a safe option to light your kitchen since they are a low power operation light source that reduces the risk of hazard, there almost no heat generation and their waterproof versions, make them more suitable for kitchen lighting. LED strip lights became more popular because it can be used to enhance the kitchen task area lighting, which in turn increase the kitchen lighting function, especially when be used as under cabinet lighting and also improve your kitchen visual appearance, you can use it in uncountable ways and ideas. Strip LED kitchen lighting is available in single and multicolor versions that enhance the idea of using this versatile LED kitchen lighting option in many decorating ideas. You can use LED strip lights to get an intense light glow when installs these thin, flexible light source hidden inside the kitchen cabinet soffit or use them to highlight the kitchen toe kicks, kitchen windows, any picture or artwork. No doubt using LED strip lights under cabinet adds incredible mood and makes the kitchen more inviting place. LED strip lights under cabinet are easy to be installed over different surface materials such as plastic, wood, and metal materials, their flexibility makes them an effective lighting solution. You should consider using LED strip lights when you begin a new kitchen design or add a magic touch with this easy to install LED kitchen lighting when upgrading an existing kitchen.